I love your illustrations - you're amazing. I wish you would so me an illustration for my cupcake business...wanting a twitter image to link to it with a bird on top of a cupcake! One of my favorite collections this season. 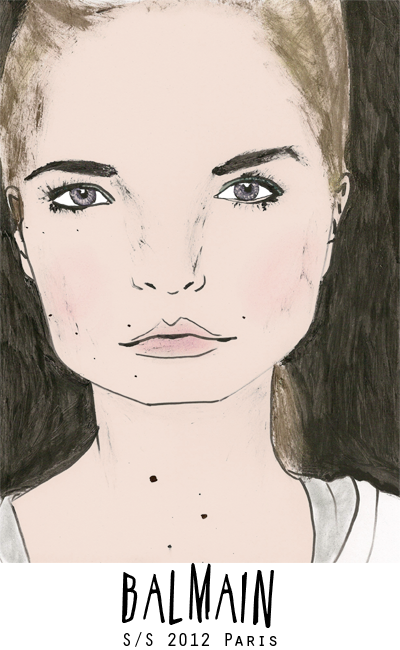 I think your illustration and whole concept of your blog are utterly amazing! i love the androgynous aesthetics of balmains collection. Awww Sarah! You're definitely my favorite artist of the moment, I even have you on my computer's favorites! You have the most pretty drawing style ever! I'm 15, a nine grader, next year I need to choose which area I'm going to... It's arts... well, I'll akways have you as an inspiration! Keep up with the good work! xxxxx, Rita!